When the rusty remains of 'The Duke' were rescued from a Welsh scrapyard in 1973, few people imagined that a complete locomotive would ever actually be seen again.The scepticism was essentially based on the fact that more than half the engine, including unique parts, was missing and this view was coloured by its less than glorious history. Unlike other big steam locomotives, which had established great reputations in British Railways' service, 'The Duke' had been a failure. A mystery steaming problem had let down mechanical technology fifty years ahead of its time, and betrayed the potential of the engine to become a "World Beater". Fortunately the rescuers were not deterred and set out on what was described as "The Impossible Dream". Their hopes were not only to restore 'The Duke' to full working condition but perhaps to find the mysterious problem affecting the boiler. Thirteen years later, a giant steel "Phoenix" arose and began rewriting history. Two faults had been found in respect of the boiler during restoration, one a mistake in design, another a mistake in construction. After flawless performances on The Great Central Railway, 'The Duke' was brought up to main line running standards at Crewe and Didcot. In March 1990 a British Railways test run from Derby to Sheffield proved that the engine had been transformed into a Supersteamer, but this still had to be proved to the rest of the world. "A moment in history was captured, as the unique three-cylinder BR '8P' 4-6-2 No. 71000 Duke of Gloucester, rebuilt from a Barry wreck, passed Tebay in the wind and rain of Monday October 2nd at the start of one of the most stirring steam-powered ascents of Shap ever recorded. The 'Duke' was the undoubted hero of the Days Out organised Shap Trials". But had 'The Duke' reached its full potential ? Finding the original faults had begun a tradition of investigating any apparent shortcomings of the engine and many improvements were made subsequently. 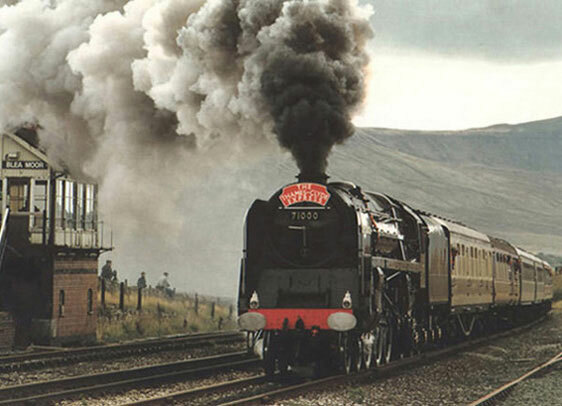 The 71000 Preservation Society, formed in 1973 became The 71000 Duke Of Gloucester Steam Locomotive Trust in 1977. Twenty years later The Heritage Lottery Fund awarded the latter a grant of £233,800 towards a programme of no less than seven major developments and a heavy general overhaul. Copyright © 2000 - 2019 by Alex Metters King & Peter King except where stated. Please rate this web site on a scale of 1-10, 10 being the best.